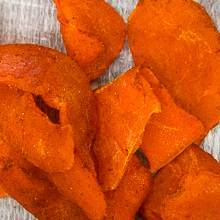 Tender and sweet mango slices lightly salted, with chili and a tangy tamarindo flavor. This is a unique flavor combination that teases your tastebuds. Tamarindo adds distinctive sweet-tart flavor and tropical flair. From Anonymous of McAllen, Texas on 1/4/2013 .